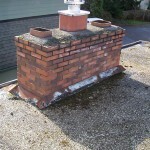 Chimneys and skylights, base and counter flashings, roof to wall connections. Install new base flashings for wood and gas stove. 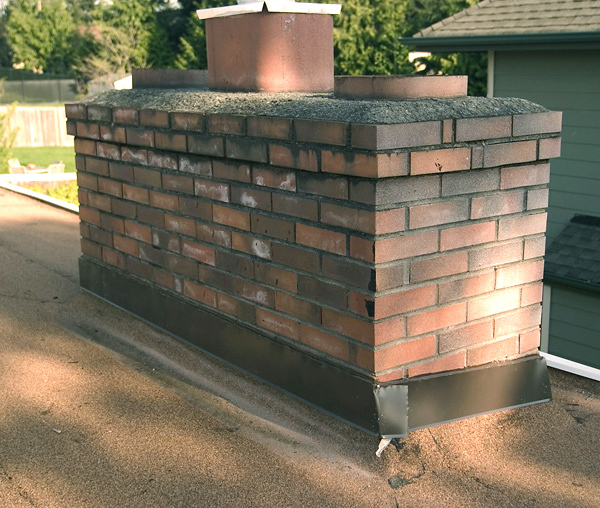 The base flashing is a stepped flashing that is bent 90 degrees and is installed between the courses of shingles and the vertical wall of the chimney. 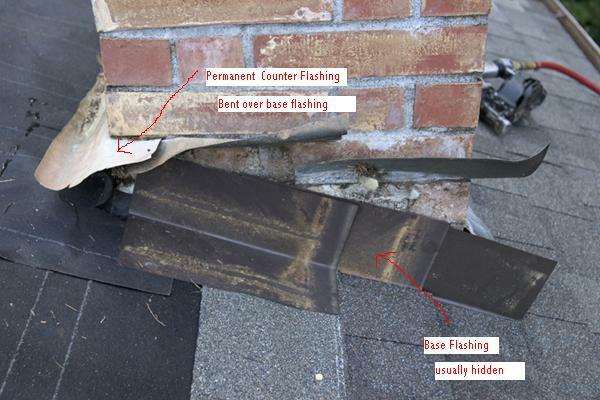 Normally this flashing is not seen because the counter flashing installed in the wall of the chimney is bent down over the vertical portion of the base flashing, and the horizontal portion of the flashing may be covered by the shingles. This flashing is normally replaced each time the roofing is replaced. When using a torch down membrane roof, the roofing membrane is used as the base flashing material and runs up the vertical walls of the chimney and under the counter flashing. 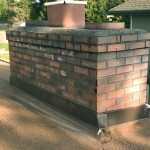 The counter flashing is usually a flashing that is embedded into the wall of the chimney. This flashing is bent downward and covers the vertical portion of the base flashing. 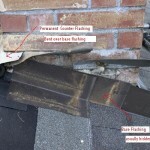 The counter flashing may not always need to be replaced with every new roof. If we feel it should be replaced, we normally list this as an option for your review. 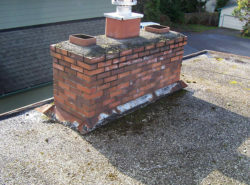 In some cases the chimney may need repairs by a brick mason and we may suggest the counter flashing be replaced by the brick mason at the same time. The old counter flashing is removed and a new factory painted brown/black flashing is installed.